Microsoft had too much news for the keynote, so they're taking care of the spillover now: First up, full Xbox Live games on demand. That's right, you can download Mass Effect, Bioshock and more. Using a real credit card—no Xbox Live points—with retail-like pricing. They're coming in August. 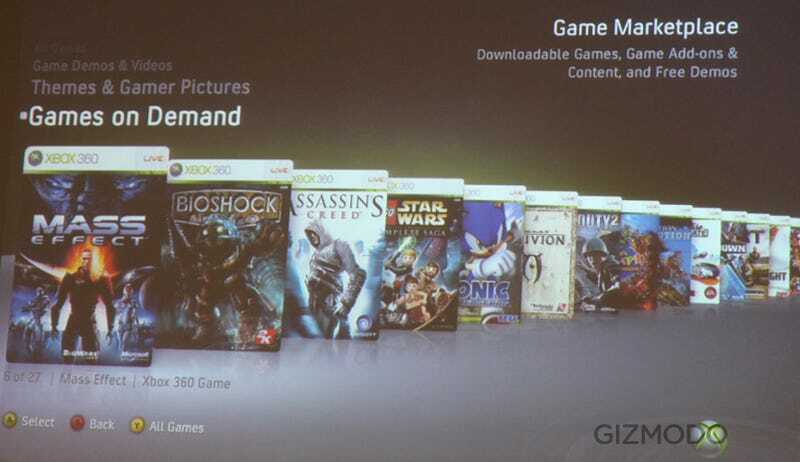 Not every game, but it is a mix of third-party stuff: Sonic, call of Duty 2, Crackdown, Bioshock Mass Effect and more. Dodged whether games will be downloadable the day they're released to retail. Also don't expect to use your credit card direct for anything now: "We're not getting rid of the point system." Booo. Still, the disc's time is clearly ticking.